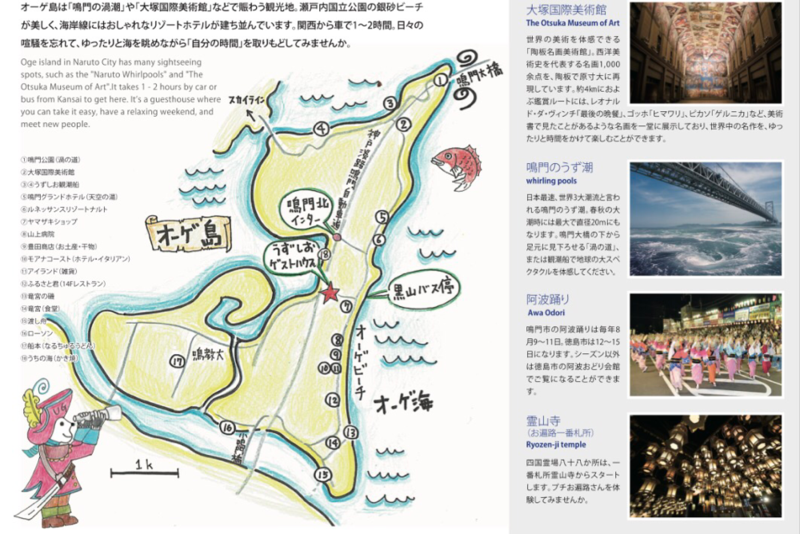 Oge island in Naruto City has many sightseeing spots, such as the "Naruto Whirlpools" and "Otsuka International Art Museum". It’s also famous for making wakame seaweed and sweet potatoes. and recently a music video was filmed here for the song "Voice of Setouchi” by “STU 48 of AKB 48”, a famous Japanese pop group. It takes 1 - 2 hours by car or bus from Kansai to get here. It’s a guesthouse where you can take it easy, have a relaxing weekend, and meet new people. Uzushio is a newly renovated Guesthous, that was originally created 50 years ago by the Landlady Chika-chan, who is now 85 years old. We wanted to give this place new life and name it "UZUSHIO GUEST HOUSE”. We want you to relax and forget the daily bustle. And we'd like to make it a small lodge near the sea which allows you to get back your time while looking at the sea relaxedly. Near Uzushio Guest House, you can enjoy this scenery by driving along the coast! The world's first ceramic board art museum reproducing masterpieces in its original dimension using ceramic boards. Naruto sea kayak experience tour and cycling tour. You can make your original crafts with marine items here! !